The Penn State University Student Chapter is a student organization sponsored by the Penn-Del-Jersey Chapter and Western PA Chapter of NECA. Throughout the school year, students collaborate on national competitions, service projects, and other group activities related to the electrical construction industry. Through this work, students are exposed to an abundance of practical knowledge in areas such as energy efficiency, clean energy, project management, and financial concepts. 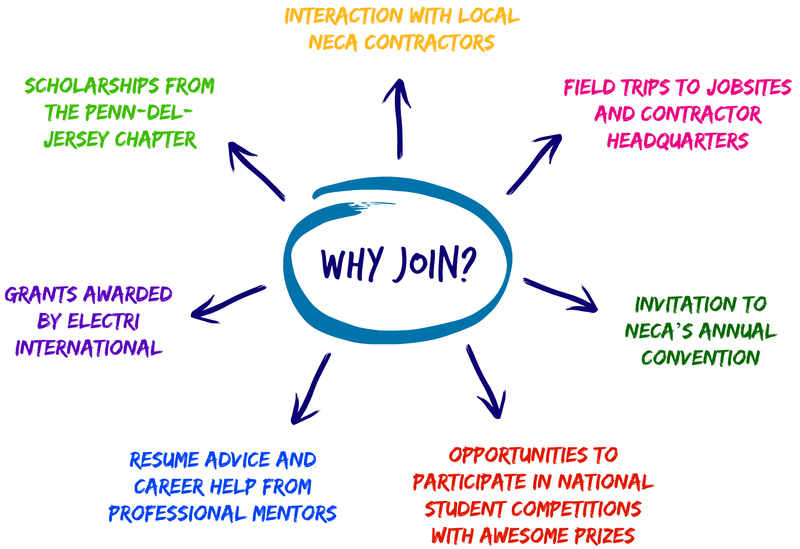 Both Chapters of NECA provide essential support for the Student Chapter, including career services, mentorship, networking opportunities, educational tours and speakers, annual scholarship awards, travel grants, and more. Through these services, students are able to connect with business owners and construction professionals to expand their knowledge of the industry beyond the classroom. The Student Chapter is nationally recognized as one of the top Chapters in the country. The Chapter earned the title of 2016 Student Chapter of the Year, won the 2015 ELECTRI International Student Passport Initiative which enabled student members to install a photovoltaic array in a community in Honduras, and placed as a finalist in the 2015 NECA Green Energy Challenge for their design to retrofit an aging building on campus. The student chapter is constantly growing and accepting new members. While many students members study electrical, energy, and/or architectural engineering, students from all academic backgrounds who are interested in being apart of this vibrant organization are welcome to join. Check us out and like us on Facebook!